USDCAD is chiefly under the influence of BoC Interest Rate Decision in Canada and Existing Home Sales along with the FOMC Minutes reports in the US. 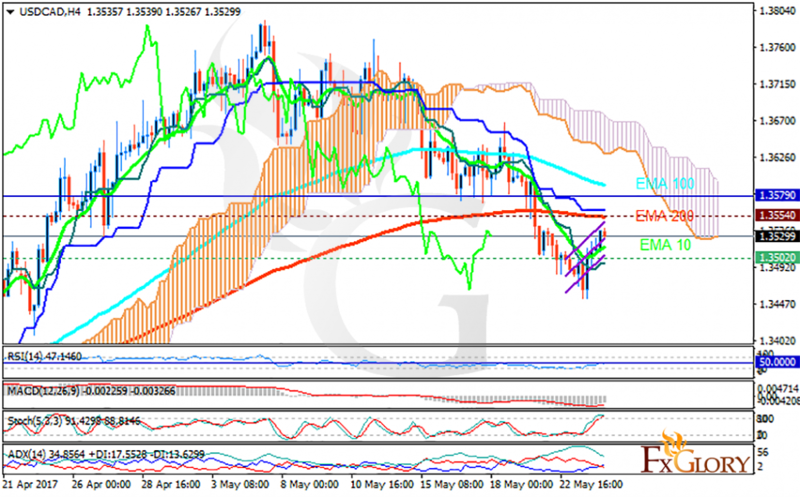 The pair is finding support at 1.35020 with resistance at 1.35540 which both lines are below the weekly pivot point at 1.35790. The EMA of 10 is moving with bullish bias along the ascendant channel but it is below the EMA of 100 and the EMA of 200. The RSI is moving horizontally on the 50 level, the MACD indicator is in negative territory and the Stochastic is moving in high ranges. The ADX is showing buy signals. The price is below the Ichimoku Cloud and the Chinkou Span. The Tenkan-sen and the Kijun-sen are both showing a horizontal trend. The indicators are not showing any firm signals however, the support level breakthrough will smooth the way for further decline targeting 1.34 otherwise it will grow to 1.36.